I knew, particularly since Edward Snowden’s revelations, that all our private electronic communications (email, among others) are under mass surveillance by government agencies (NSA/CIA and other bodies) and involve mail services such as Gmail, YahooMail, Hotmail and AOL mail. I naively believed that POSTAL mail (i.e. PAPER correspondence) would remain sheltered from that totalitarian intrusion in our private lives. However, I recently stumbled on a private letter of mine dated 2007 (a “traditional” “paper” one, not a trivial email message) published by a third body “on the internet” (needless to say, without any permission…). Available through search engines, the document has been scanned by an “invisible hand”, converted to a « pdf » file and posted online , not by any maniac but the very official University of California at San Francisco (“Legacy Foundation”). Consequently, my best response to Totalitarians in power is to publish myself, in my turn, my own Letter dated 2007. As readers will see, its content deals with merely scientific matters . By opening postal private mail of a non-US citizen, staff of the so-called “Legacy Foundation” affiliated with the University of California at San Francisco violates human privacy on a much greater scale than the NSA/CIA. I wish to share with the executive staff of the Altria Group two conclusions I draw from my recent contact with the four above mentioned staff members of your company who, put together, are the authors of a tetralogy on the electrically heated cigarette. As the main library I work with was not a subscriber of the Journal of Applied Toxicology, in which the four studies were published, I wrote to each of them to ask them to be kind enough to provide me with corresponding electronic copies. This is a common practice among researchers. Indeed, they had actually advertised their personal email addresses in the abstracts published in the international scientific databases. I followed up on my callow request and eventually sent them a reminder; in vain. In these conditions, I had to go to another library in another district of the city where I live. There, I found the journal and the papers and this is all there was to it. I was actually interested in this tetralogy only because I thought its findings could help me understood better some chemical and biochemical processes in relation with narghile (hookah, shisha) smoking. 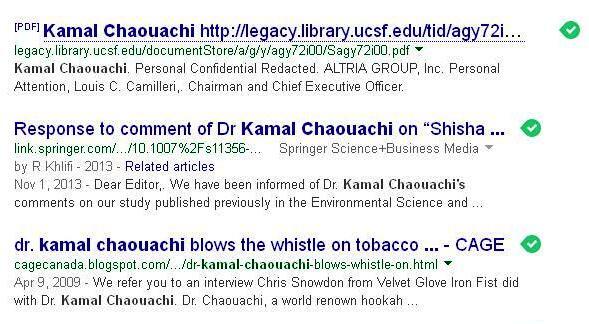 However, these four studies did not contain any new facts for me as I have been investigating the chemistry of narghile smoke for a while now. I found out that there are some similarities but also striking discrepancies between cigarette and narghile smokes. For instance, I already know, for having performed the tests myself, that electrical heating of tobacco -or a tobacco-molasses based mixture- cuts down carbon monoxide -and other toxic products- in a great proportion. I deeply regret the lack of cooperation from your staff. This is unusual in the field of research, indeed. I understood that they might not have wanted to maintain any relation, even as a short-lived epistolary exchange, with a researcher working on narghile smoking. They may also have received instructions in this respect. I think such a shopkeeper’s mentality is not necessary for a prestigious company like yours and even negative for its outside image. -that narghile smoking, and once again for many reasons, might not be a gateway to cigarette smoking. In other words, a teenager who would have practiced hookah smoking for a while, might eventually find it difficult to switch or come back to cigarette smoking. This is only a hypothesis that I am testing with colleagues. In the light of these facts (although there are many others) and the confusion and blackout maintained by an entire die-hard crusade-minded wing of the international Tobacco Control movement on my research and on my own existence [ 2 ] , I may be naturally driven to the conclusion that these people may share the same viewpoint as yours regarding the new world hookah epidemic. If I am wrong, please tell me. I am anxious to know. An anti-tobacco activist one day said that, unlike the “Oriental” narghile, cigarettes are “a part of our [Western] culture”. In the light of this assumption and the present geopolitical context of a so-called “clash of civilisations”, the American Way of Life the Tobacco Industry has sold to all teenagers of the world for decades, would be, today, jeopardised by the emergence of an Oriental Way of Life… Finally, your researchers could recognise that the idea of an electrically heated cigarette was inspired by the narghile. They could follow the example of the Waterford cigarette’s inventors who did acknowledge this fact. Patskan G, Reininghaus W. Toxicological evaluation of an electrically heated cigarette. Part 1: Overview of technical concepts and summary of findings. J Appl Toxicol. 2003 Sep-Oct;23(5):323-8. Stabbert R, Voncken P, Rustemeier K, Haussmann HJ, Roemer E, Schaffernicht H, Patskan G. Toxicological evaluation of an electrically heated cigarette. Part 2: Chemical composition of mainstream smoke. J Appl Toxicol. 2003 Sep-Oct;23(5):329-39. Tewes FJ, Meisgen TJ, Veltel DJ, Roemer E, Patskan G. Toxicological evaluation of an electrically heated cigarette. Part 3: Genotoxicity and cytotoxicity of mainstream smoke. J Appl Toxicol. 2003 Sep-Oct;23(5):341-8. Terpstra PM, Teredesai A, Vanscheeuwijck PM, Verbeeck J, Schepers G, Radtke F, Kuhl P, Gomm W, Anskeit E, Patskan G. Toxicological evaluation of an electrically heated cigarette. Part 4: Subchronic inhalation toxicology. J Appl Toxicol. 2003 Sep-Oct;23(5):349-62.